Every once in a while a brand (or rep) will contact me about testing gear. A lot of times it just doesn’t fit with what I do, sometimes it fits but I’m kinda settled with the gear I have. Point being, I tend to turn away a fair amount of stuff throughout the year because I don’t feel like I can do it justice. But when someone offers me coffee, I’m in! I first saw Pronto Cafe mentioned at HikinginFinland.com earlier in the year. Pronto Cafe is a French product with coffee roasted in Italy and packaged in Switzerland. I didn’t expect to find it in the US, so didn’t give it much thought. With Sport-Hansa now bringing the product to the US, I was happy to be able to try it. Each package weighs in at only 8 grams and delivers about 8oz of fresh brewed Arabica coffee. In the sealed package they are supposed to have at least a 12 month shelf life. Pronto Cafe seems to be available in a 3 pack sampler (for $3.87) or a 10 pack box (for $12.29) which calcs out to a cup of fresh brewed coffee for about $1.25 each. Recently I had a chance to do a quick day hike with some awesome Twitter friends in the Superstition Mountains outside of Phoenix. It was a cold, rainy weekend perfect for desert hiking and fun (dangerous) creek crossings. 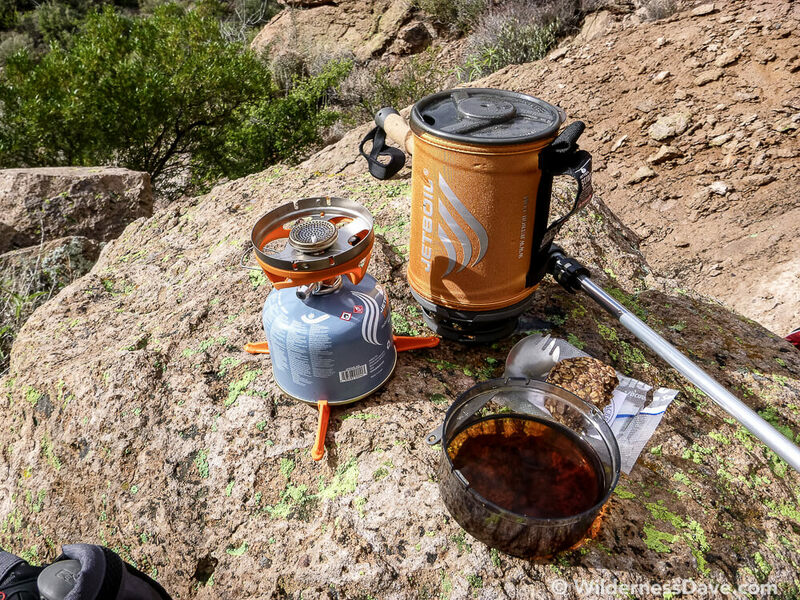 As is my usual custom, I brought a Jetboil with me on this day hike so we could warm ourselves up with a hot beverage when we stopped for lunch. Among the assorted beverages was the new Pronto Cafe packets. When we stopped I was able to offer up coffee, tea, hot chocolate and hot apple cider. We tried several of the options including the coffee from Pronto Cafe. The packets are pretty simple, a bit of ground coffee in a small brewing pouch with built in support arms on either side to allow it to rest at the rim of your cup while you pour water over the grounds. The water seeps through, delivering hot fresh brewed coffee. We set everything up and began to pour the heated water through but it poured through very fast not allowing much of a steep with the grounds. As expected, this gave us pretty weak coffee and left me wondering if there was something that could be done. Later I decided to try it again, but this time I tried to compact the grounds a little in the pouch before pouring the water in. I also deliberately slowed the rate of pour (previously I simply filled the pouch then let it drain out, filled again etc.). I also made sure I delivered a measured amount of water so as not to dilute the brew. This method seemed to deliver a better, richer cup of coffee. The trick seems to be to create a little more of a condensed layer of grounds, then trickle the water through. It still filters through quickly, but you do seem to be able to control the strength of the brew in this way. All in all, not a bad cup of coffee for a single-serve lightweight option. 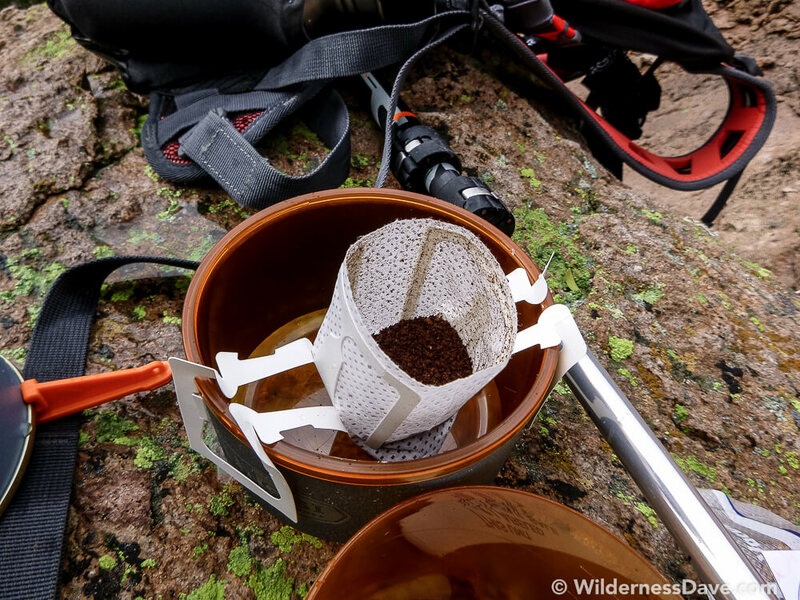 It certainly is lighter and creates less waste than many other brews I’ve tried for the backcountry. 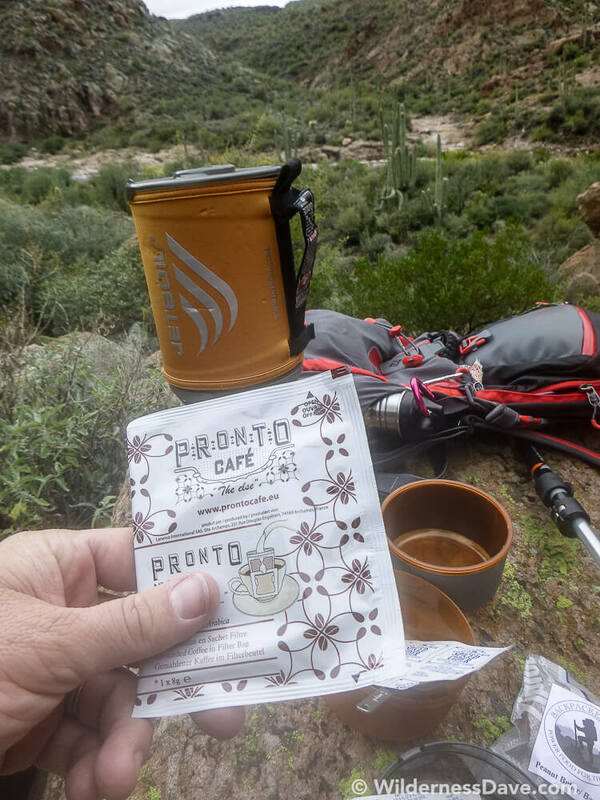 Outside of bringing your own instant coffee, Pronto Cafe seems to be the most compact, lightweight and low waste product on the market. Given the luxury of space and weight, I still prefer my french press…but this is a good alternative for those lightweight scenarios.